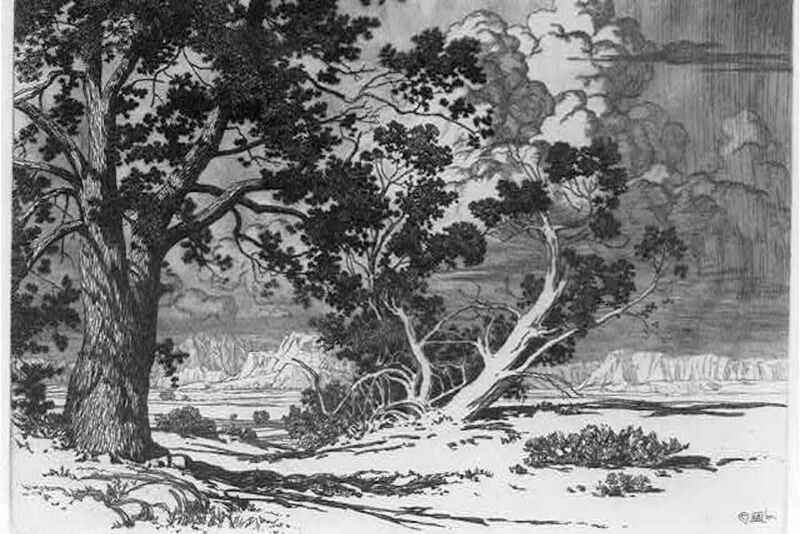 Etching of piñon trees, New Mexico, by George Elbert Burr. Image courtesy of Library of Congress. just as a gutter, one of its definitions, can. But mine is high in the desert and dry as scorn. The sun bakes long-suffering into that dirt. the color of acceptance. To make roots. to the land. Not at first. the scrub made friends. Fell in love. I was drinking when I fell into an arroyo. if he thought I was after his daughter. Unless he hoped for a daughter-in-law. A piñon tree ordered the scrub to resist my pull. those constellations are really laughing. I saw them. I was on my back. snarled at the dirt and scrub to ignore me. No one argues with stones. Sarah Sarai is the author of Geographies of Soul and Taffeta and The Future Is Happy. She is from New York State, California, New Mexico, Washington, and New York City, in that order.